Multiple gases contribute to the greenhouse effect that sets Earth’s temperature over geologic time. Small changes in the atmospheric concentration of these gases can lead to changes in temperature that make the difference between ice ages when mastodons roamed the Earth, and the sweltering heat in which the dinosaurs lived. Two characteristics of atmospheric gases determine the strength of their greenhouse effect. The first is the Global Warming Potential (GWP), a measure of the radiative effect of each unit of gas over a specified period of time, expressed relative to the radiative effect of carbon dioxide (CO2). An amount of gas with high GWP will warm the Earth more than the same amount of CO2. The second is the atmospheric lifetime, which measures how long the gas stays in the atmosphere before natural processes (e.g., chemical reaction) remove it. A gas with a long lifetime can exert more warming influence than a gas with a short lifetime (assuming the GWPs are equal). The table below presents values for these two characteristics for major greenhouse gases. The GWP and atmospheric lifetime values are periodically updated by the scientific community as new research refines estimates of radiative properties and atmospheric removal mechanisms (sinks) for each gas. These values are from the Fourth IPCC Assessment Report (AR4) released in 2007, which are commonly used in international reporting, despite the Fifth Assessment Report updating them in 2014. Fourth Assessment Report (Intergovernmental Panel on Climate Change IPCC, 2007). The table below shows the relative concentrations of these major greenhouse gases and their sources. Some gases (like CO2) are made by both natural and manmade processes, while others (like the fluorinated gases) are only the result of human industrial activity. CO2 is typically measured in parts per million because it is 1,000 times more prevalent than the other gases, but is shown as parts per billion in the table for consistency. Atmospheric concentrations are all shown in parts per billion (ppb). 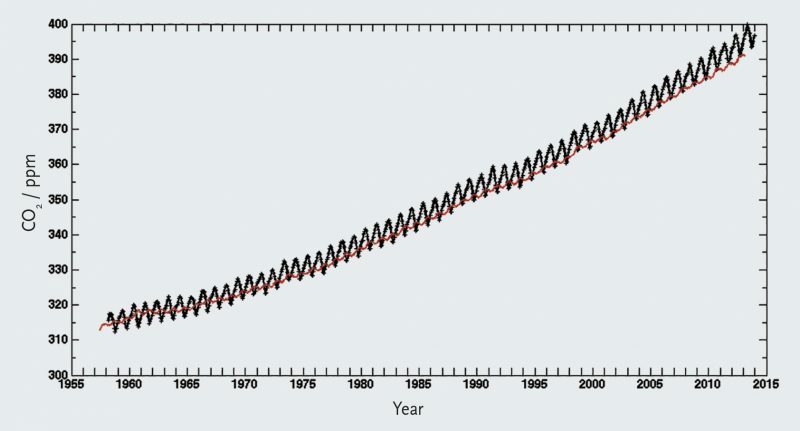 Measurements of atmospheric CO2 since 1958 from the Mauna Loa Observatory in Hawaii (black) and from the South Pole (red) show a steady annual increase in atmospheric CO2 concentration. The small up and down saw-tooth pattern reflects seasonal changes in the release and uptake of CO2 by plants. *Carbon dioxide is quite stable in Earth’s atmosphere, but individual CO2 molecules are in near constant flux from difference reservoirs, such as the surface ocean, land biota, and the atmosphere. A commonly used estimate for CO2 lifetime is 100 years, but this really only reflects the lifetime of a portion of the atmospheric CO2 reservoir. Some portion has a lifetime of up to 1,000 years (IPCC 2007, FAQs).